קריאה בתורה בנוסח מרוקאי לצפייה ושמיעה! עליות ראשון,מפטיר והפטרה של כל הפרשות! טעמי המקרא,שיר השירים ומגילת אסתר! חדש! כל הרבנים על ימי ספירת העומר מומלץ בחום! פרשת ,,,, -מה זה מחצית השקל ולמה נותנים את מחצית השקל? ולמה מכריזים על השקלים בחודש אדר? למה המילים משכן ומשכון הם אותו השורש? באתר תמצאו מאגר מלא ומסודר של כל שיעורי הרב. השיעורים בפורמט לצפייה והאזנה וניתנים גם להורדה. חדש! פרשת – הכרת הטוב הרב הרצל חודר מומלץ ומרתק ביותר!!! שיעורו השבועי של מורנו הרב שמואל אליהו על פרשת בדינים והלכות הנלמדות מירידת המן במדבר.. צפייה מהנה..
לעוד שיעורים של הרב ועוד רבנים אחרים יותר מ – 7.5000 שיעורים!! פרשת רב הצדיק רבי יוסף שובלי שליט”א. שתי דקות תורה – חידושים קצרים על פרשת שבוע. הרב אורי זוהר ממשיך בסדר הפרשיות והמוסר שעומד מאחוריהם והפעם פרשת שמות. הרב שקד בוהדנה שליט”א – פרשת ” ” תשע”א. מה התועלת שיצאה מהשיעבוד במצרים? ומה עלינו ללמוד מכך. Haftara of Perashat Qedoshim during a year that this perasha is not read in conjunction with Aharé-Mot. On the Hilula of Baba Sali on Motsae Shabbat January 8th, the Sephardic Community got together at Abir Yaakob Congregation to sing the Moroccan Bakashot of Parashat Bo along with some of the piyutim of Yagel Yaakob. Moshe wanted to judge the people all by himself. His father in law yitro didn’t like that idea and advised him to appoint judges. What was the basis of their argument and why did Yitro win the debate? R.Rabbi Joel Finkelstein of ASBEE . Rabbi Avraham Tzvi Schwartz . A Mayanot Moment- Parshat …. http://www.partnersintorah.org brings you Harry’s Video Blog and the always entertaining Harry Rothenberg. One of the laws of charity requires the community to restore a wealthy person who loses his money to his previous level of lifestyle. Why? Stay tuned for Harry’s weekly video blog where he will be highlighting the weekly Torah portion, a mitzvah, or a Jewish holiday along with a contemporary application and a healthy slice of humor. This is the Official Youtube channel of Netiv Center For Torah Study in Houston Texas. It purpose it to teach Universal Torah to the nations. Neitv is a diverse community of individuals from all walks of life dedicated to God and His Torah. The purpose of this channel is to give a quick opportunity for a person that wants to learn the Likutei Torah on the Porsho but does not have the time and energy to do so. 24JEWISH Parshat Hashavuah, Rabbanim, Rabbi Dr. Jacob J. Schacter , language english, SHIURIM & COMMENTARIESby 24JEWISHParshat Hashavuah, Rabbanim, Rabbi Dr. Jacob J…. La Paracha Yitro. Les 10 Paroles. Diffusion des cours du Rav Barkatz et autres intervenats de la Yechiva Or Gabriel. BH, VOICI LE COURS DE TORAH NO”5 DU GRAND RABBIN, SUR LA PARACHAT BECHALA’H. Des secrets, sur la traversé de la mer . En quoi sa nous parle personnellement aujourd’hui grâce a l’enseignement de la hassidoute habad , sur le site torah or , avec la grâce de D..
La paracha de la semaine. Béchala’h. Notre attachement a D’ieu. La paracha en 5 minutes. 5 minutes sur la paracha de cette semaine Béchala’h par le Rav Binyamin Mergui. Paracha Béchala’h, de la sortie d’Egypte à la Manne divine. Chabbat Chira – Youd Chevat tombe Chabbat cette année et nous permet de nous relier au Rabbi Rayats ainsi qu’au Rabbi Roi Machia’h et de faire descendre les bénédictions dans notre réalité..
COURS DEDIE A LA HILLOULA DE BABA SALE et à la mémoire de ITZHAK BEN SIMHA, Yossef ben Chlomo, Yekoutiel ben Messodi, Eliyhaou ben Nouna, Azar ben Tsion, Alexis Tsemar ben Fortuné et Aaron ben Simi, ainsi que pour la guérison totale de David ben Rahel, Yehouda ben Rahel, Mike Meyer Haim ben Simha, Touna bat Esther, Esther bat Rahel, Chalom ben Avraham, Hamous ben Rahel, Eliyahou ben Chlomo, Moche ben Avraham. Rav Raphael Pinto Paracha …. Peiner, puis faire les Mitsvots avec joie, cela apporte en nous l’amour de D-ieu ! Rav Ron Chaya et Leava vous présentent ” Peiner, puis faire les Mitsvots avec joie, cela apporte en nous l’amour de D-ieu ! “. Rav Yossef Tordjmann présente: Paracha …..
Cours dédié à la mémoire de Fortunée Messaouda bat Myriam, Esther bat Messaouda, Victor Haim ben Atou, Martine Aziza bat Yvonne Myriam, Reine bat Haki, Dina bat Diamanté, Gaston Haim Yehouda ben Rina, Moche Dov ben Haziza et Julie Zouira bat Kouika, ainsi que pour la guérison complète du bébé Odaya Haya bat Vicky Rivka Shila, Antoine ben Emile, Haim Mickael ben Rivka, Makhlouf ben Haya, David ben Rahel, Yehouda ben Rahel, Mike Meyer Haim ben Simha, Touna bat Esther, Esther bat Rahel, Chalom ben Avraham, Haya bat Rahel, Hamous ben Rahel, Eliyahou ben Chlomo, Moche ben Avraham et Bilha Braha bat Rahel. 5 minutes sur la paracha de cette semaine par le Rav Messod Touboul. Parachat de la semaine …. Chalom Jerusalem…. 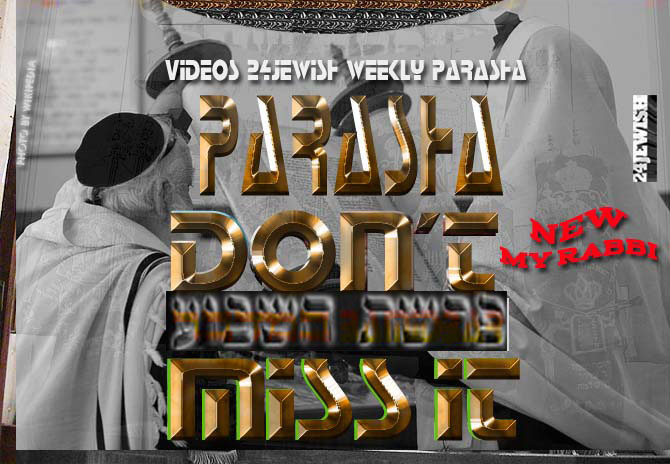 Grand Rabbin Gilles Bernheim / Parasha ….